Cafe Clover, developed in partnership with restaurateurs David Rabin and Kyle Hotchkiss Carone, delivers health-conscious fare in a chic, upscale atmosphere that appeals to a fashionable downtown NYC clientele. Accordingly, our branding -- included naming, visual identity design, and materials -- was designed to project a fresh, thoroughly modern sensibility that steered clear of the typically drab earth-tones and rough hewn aesthetic that most associate with healthy eating. First and foremost, this is top notch dining experience. It just so happens to be incredibly healthy. The brand design carries a light touch while remaining highly distinctive - reflecting the Cafe Clover experience and also providing a suitably, clean, understated canvas for the food itself. The branding work included the design of the Downing St. entranceway, conceived as an upscale rendition of classic barn doors. A chic indoor-outdoor dining experience at The Montage Beverly Hills by renowned chef Geoffrey Zakarian, Georgie achieves upscale refinement with an breezy, whimsical touch. Love & War's branding for Georgie employs a singular palette layered with original line art to set a fashionable yet casual tone - a reflection of both Chef Zakarian's personality and the taste of the target audience. All while adding pops of vibrancy to the clean, elegant interiors by Gachot. Our branding for Georgie extended into many different details and expressions, including the distinctive royal blue staff uniforms emblazoned with the freehand "G."
In addition to Georgie, Love & War developed the branding for "The Garden Bar," also in The Montage Beverly Hills. Working with two-time James Beard Award winning chef Andrew Carmellini and NoHo Hospitality, Love & War developed the branding for Mister Dips - a hamburger, beer, and ice-cream stand built into a vintage Airstream on the elevated green space at The William Vale Hotel in Brooklyn. Love & War's branding - including the visual identity, materials, signage, and the design of the Airstream itself - cuts loose with a wild mix of cultural references, celebrities, op-art graphics, and other influences to create a trippy, subversive mash-up of classic American tropes. The eyes have it. Why googly eyes? Why not! They're odd and interesting and, as we found, can be applied anywhere to humorous effect. Our branding included the full food packaging system, the design of the Airstream trailer, and even the numbered runner system, which has a little fun with some celebrity favorites, from A-listers on down. Way down. Love & War's branding for The Hall -- a Joie de Vivre / Two Roads hotel -- presents a fresh take on the heritage and architecture of the building itself, a Miami Deco classic complete with curvilinear forms, vertical central tower, breezeblock details, and a lush central courtyard. In addition to the hotel, Love & War developed the branding for all of the on-site F&B venues, including "Sunny's" - a breezy outdoor spot by Chef Spike Mendelsohn. Classic Art Deco lines and contemporary graphics unite in Love & War's visual identity system for The Hall. Brand design for Sunny's - a throwback "snack bar" by Chef Spike Mendelsohn - included original mascot design. Mr. Banana, Mr. Pineapple, and Senior Flamingo characters pictured above. Love & War was responsible for the complete overhaul of The Plaza Hotel's branding, including the development of a new logo and visual identity system, guest materials, advertising, retail packaging, and environmental graphics as well as the full concept and design execution of The Plaza's new website. In addition to the rebranding of The Plaza, Love & War also developed new branding for the hotel's F&B outlets, including The Champagne Bar, The Palm Court, and The Rose Club. The rebranding of The Plaza maintains the stature of the hotel and honors its place in history while remaining relevant to today's audiences. Love & War designed The Plaza's new website as well as all the different materials that make up the guest experience, from in-room guidebooks and amenities to product packaging. We worked with the legendary French plateware company Bernardaud to develop custom plateware and settings for The Palm Court. Our work also included redesigned plateware, settings, and materials for "Eloise Tea" - a favorite at The Palm Court for generations. Love & War developed the branding for Westlight - a rooftop bar and dining experience by Chef Andrew Carmellini and Noho Hospitality, including the naming, visual identity system, signage, materials, and website. The visual identity system builds off of Westlight's stunning views - both in the gradients used and in distinctive perspective view of the logotype. In recent years, Miami has been inundated with restaurant concepts from New York, LA, and other outside areas. Lacking was a restaurant that truly honored Florida culture and cuisine in an authentic, credible way. Working with Chef Kris Wessel - a third generation Floridian - Love and War developed the concept, naming, branding, materials, and communications for Florida Cookery at The James hotel - an culinary ode to Florida featuring homespun recipes and expertly rendered local, native ingredients. Our work was inspired by Chef Kris Wessel's own family history in Florida, which went back generations. We incorporated vintage photographs, recipe cards, and mementos from from his personal archives into the brand design. Handwritten menus and ample use of watercolors imparted an elegant, natural touch and reemphasized the personal, authentic qualities of the brand. One of the most famous resorts in The Hamptons, Gurney's was facing an intensified competitive landscape that had emerged with Montauk's recent rise in prominence as a destination for vacationing New Yorkers. To help meet this challenge, Love & War worked with the Gurney's team to redevelop and relaunch the resort brand as well as that of its four on-site restaurants: The Seawater Grill, The Ocean Cafe, The Market, and The Beach Club. A key point of inspiration for the brand was Montauk itself, which is known for its easy, unpretentious style and classic charm. Rather than try to "out-luxury" the competition, our goal was to reassert Gurney's as the authentic Montauk destination, with an effortless, understated sophistication differentiated from more rowdy, seasonally-driven competitors. Our re-branding extended even to the smallest details, from the in-room compendium to clothing sold at the on-site boutique to new package design for the line of health and beauty products sold at Gurney's Seawater Spa. Our work also included the rebranding of The Beach Club at Gurney's, the only on-beach dining in all of Montauk or The Hamptons. Love & War develops and executes all of Stratton Mountain's advertising - including print, transit, out of home, and digital. The campaign we developed and have been running for over three years, combines classic imagery with contemporary language and references, helping Stratton engage younger audiences while reinforcing its position as Vermont's one true classic ski destination . Punctuated with the tag line "Let's Winter," our campaign celebrates the joys of Winter and positions Stratton as the ultimate seasonal destination. New Yorkers may "summer" in the Hamptons, but they "winter" at Stratton. The campaign appears on a full range of media, including print, digital, and a wide range of out-of-home billboards and transit advertising in and around New York City. Working with Philip Scotti and the team at The Clarkes' Group, Love & War refreshed the P.J. 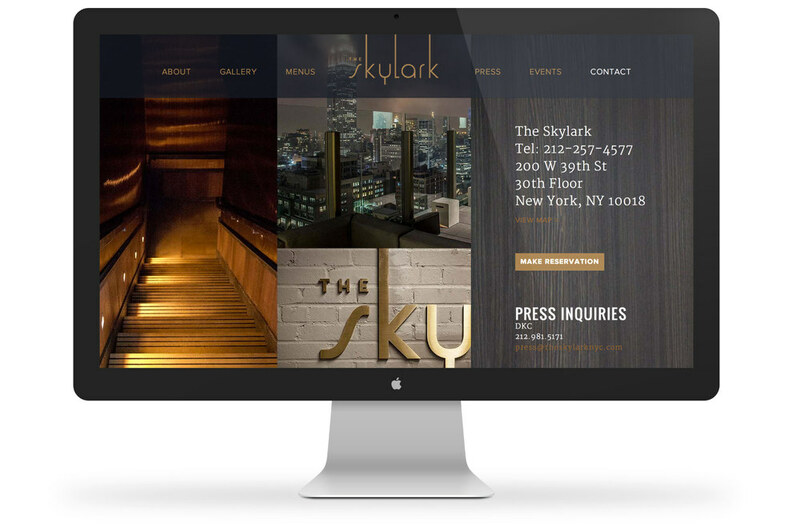 Clarke's brand and visual identity and developed its advertising, materials, website, photography, and other communications.